Your efforts must focus…on an invisible path, which only you can see and on which you allow yourself no excuses. Yukio Utada was born in Tokyo, Japan in 1948. The youngest of 9 children, he excelled athletically since a very young age. He was exposed to various Japanese martial arts but was determined to find an art that developed not only the body but also elevated the human spirit. Mr. Utada discovered these qualities at the Yoshinkan Aikido Hombu Dojo in Tokyo. There he found a place radiating with energy and excitement. The dojo training was dynamic, magnetic in its pull. Mr. Utada committed himself wholeheartedly to aikido training, devoting himself fully to the art. He was fortunate in choosing as his teacher the founder of Yoshinkan aikido, Gozo Shioda Kancho, who had been a student of the great Morihei Ueshiba, the founder of modern aikido. Mr. Utada immersed himself in the study of aikido, following as he would later refer to his own “invisible path.” After training for only nine months, at the age of 19, Mr. Utada distinguished himself in an unprecedented fashion by attaining his first-degree black belt. In 1972, Mr. Utada journeyed to the United States accepting an invitation to teach Yoshinkan aikido in Detroit, Michigan. The following year Mr. Utada was joined by Kushida Sensei who was the chief instructor of the Hombu dojo at that time. Mr. Utada assisted Kushida Sensei in establishing the presence of Yoshinkan aikido in the United Sates. He underwent traditional uchi-deshi (live-in student) training prior to relocating to Philadelphia. Over the next seventeen years Mr. Utada maintained strong ties with Kushida Sensei. This student-teacher relationship allowed Mr. Utada to deepen his understanding of aikido and continue to grow as a professional instructor. With few resources but a vision of the Yoshinkan school he wanted to build, Utada Sensei opened his first Philadelphia dojo in 1974. From meager beginnings, the spartan school evolved in time into the Aikido Association of North America (AANA). In 1991, Utada Sensei saw an opportunity to move his school to its present location in Philadelphia. The Doshinkan Dojo, located in a freestanding structure, is one of the finest such facilities on the East Coast. This beautiful building and grounds serve as both school and headquarters for the AANA. The dojo is a superb space to showcase the dynamic aikido taught within. Since its founding, the Doshinkan dojo has continued to flourish establishing several affiliate schools in the greater Philadelphia area. 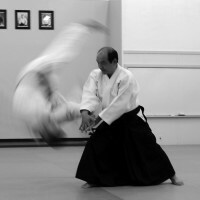 In addition, Utada Sensei has been a faculty member of Temple University since 1974, Over the years, his popular classes have brought aikido to thousands of students in and around greater Philadelphia. Utada Sensei has also showcased aikido at University of Pennsylvania, Beaver College, Haverford College, and Rutgers University to name a few. Mr. Utada is a registered Shihan who was awarded the rank of 7th dan ranking in Yoshinkan aikido by Soke Gozo Shioda. He then established his own Doshinkan Aikido style. For more information about Utada sensei’s seminar and appearance schedule, contact us at the address below. The Aikido Association of North America is a nation-wide organization of dojos and aikidoka dedicated to providing the best in aikido training and education.